Over the last couple of years, one of the places I’ve loved to go looking for that amazing country music artist or album that few if any have heard of in the rest of the world, but is exactly the type of true country music the whole world craves, is in the land Down Under. There’s many great Australian artists we already know about in the United States like Kasey Chambers, but I’m talking about guys like Roo Arcus who I discovered last year, or Tammy Neilson in neighboring New Zealand—artists who totally blow you away as soon as you push play, and are only unknown to you due to country of origin. Australia has such a rich cowboy culture of farming and ranching, and plenty of wild frontier, it’s second to only to the United States when it comes to finding people who live it first, and then sing about it later. But with Australian country singer Doug Bruce, you get the best of both worlds. Born in Aubrey, TX into a musical family, Bruce spent much of his early adult life as a drummer in country bands touring Texas and beyond, including in a band called Cheyenne, playing venues like Billy Bob’s Texas, and opening for acts like Jerry Jeff Walker, Charlie Robison. Doug also worked as a session drummer and a background vocalist, setting the stage for him to come out from behind the drums and sing his own songs. 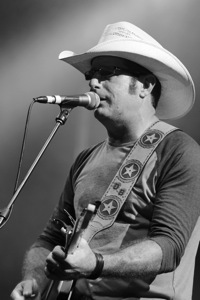 Doug eventually moved to Nashville to be a songwriter, and began performing with a new group of musicians like Billy Yates, and found the opportunity to play the Grand Ole Opry a couple of times. Along with his 20 years of playing country music in Texas and beyond, Doug Bruce came from a strong country music pedigree. Doug’s father Dale was a rhythm section player as well, handling bass duties for Red Stegall and Johnny Duncan. And Doug’s uncle Buddy Bruce was a songwriter who landed cuts with the likes of Minnie Pearl and Red Sovine, and recorded for Starday. It’s uncle Buddy that inspired Doug Bruce’s new record, even though Buddy’s heyday was a half century ago, and seven years ago Doug moved to Bendigo, Australia to be with his wife who he met in Nashville. Despite the distance between his past and current musical life, Doug has done his best to build a country music career in Aussie Land, and has been decorated with numerous awards from the Australian country music industry, even finding play on Australian country radio. 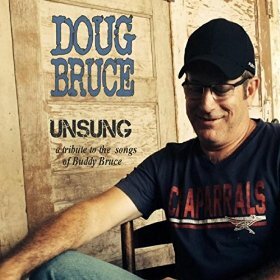 Though most of Doug’s records contain a slightly more contemporary style of traditional country, his new record Unsung: A Tribute to the Songs of Buddy Bruce is all about reawakening the classic country sound, and setting it to a selection of his uncle’s tunes. You come for the music, which is lavished with steel guitar and twang and traditional country tones in a perfect representation of the material, but you stay for the songwriting. It’s unreal how songs like “The Tears” and “Greatest Expert” were never super hits back in their day, and quite frankly I’m not sure songs like these could be written by modern songwriters even if they tried. It takes the perspective of the 50’s and 60’s to pen such authentic country sentiments, yet I can’t stress enough the magic in this music since you’ve never heard it before. It’s like hearing Hank Williams again for the first time. And Doug Bruce turned out to be the perfect candidate to interpret this music to the modern world, not just because he could bring love to it from the familial relationship, but living in Australia might actually give him a better perspective on American country music than most. It’s like how Loretta Lynn had to move to Washington State to see the beauty of Butcher Holler. Only by living in a foreign place could she look back on her home fondly and with longing in her heart, and sing about her experiences to the rest of the world. In the same way, Doug Bruce is taking the songs of his uncle, and using it to create a piece of home in his heart. And how lucky we all are that he decided to share it with the rest of us. One of the issues with traditional country is that it can sound tired after you hear the same songs, or the same approach over and over. But Unsung solves that issue. It’s got a little bit of everything, with the Western swing feel of “Help The New Family Move In,” to the balladry of “Lie To Me,” and the honky-tonk heart of “The Tears.” Yet Doug also figured out how to slide in some slightly new and interesting compositions in with songs like “Nothin’ Yet,” and the strange chords of “Change Your Tune.” Though the material is old and from a certain era, Unsung offers incredible variety and never feels boring., and the stripped-down final track “Night Before The Morning After Game” might be the funnest of them all. There’s heartbreaks, there’s happiness, there’s a by gone sense of home and community, and overall there’s just some excellent country music that has gone “unsung” for too long and shouldn’t be confined by international borders. Unsung: A Tribute to the Songs of Buddy Bruce features musicians Stuie French, Michael Rose, Rusty Cochrane, Vaughan Jones, Jacob McGuffie, and Jeene Fleenor. Thanks for the heads up. Another artist from that area with a new album coming is Marlon Williams. Hah, I was going to say just that!! Marlon is a stellar talent with a distinctive voice (which can be heard in a duet on Tami Neilson’s album, btw). Perhaps due to his Maori heritage there is a slight Pacifica twang to be detected in what he does, kind of like in Hawaiian music, which makes him unique in my ears. I can’t recommend him enough. ..aint that the damn truth. really liked that Nothin’ Yet also. Unrelated but just as interesting a interview with Peter Guralnick the music critic historian. Lots of talk about Sun Records. Early R’n’R and why Charlie Rich became Charlie Rich and how that paper burning incident may have been more about his complacency with the status quo more so than anything to do with John Denver. Totally fascinating. Thanks a million for the review, Trigger. I appreciate you! Listened to the tracks on youtube and was really impressed with the variety and the sound. I went to Doug’s website to purchase a physical copy and am not sure what’s going on. I clicked on what looks like a link to purchase and it brings me to a screen saying ‘send money to Doug’ with a price of $25 but doesn’t show that you are purchasing an album. It will also let you change the price to a dollar and let you move forward. Is this how we purchase a physical copy. I see digital copies on amazon but would prefer a physical copy. I should probably send this message straight to Doug’s shop but was hoping I could get a follow up here in case anyone else is confused like me. Thanks and great album! Hi Travis, and thank you. If buying direct from my website, I get a message that you have purchased Unsung directly from that transaction. There is a spot for you to enter your postal address (and for messages – such as a request to sign it) and I send it directly to you. The $25 is in Aussie dollars so will only take the equivalent amount in the dollars you are using on Paypal. I do not charge postage and will send to anywhere in the world. If you are not happy with the direct method, you can also get a physical copy via http://www.cdbaby.com/cd/dougbruce7 (quoted in USD). Very interesting find Trigger, I know I might be in the minority, but this is why I check this website daily. The discovery of new music is what makes me keep coming back and spreading the gospel of Saving Country Music to all my musical friends. Just a side note, any plans to review the new Phil Hamilton album titled “Brazos Wind” Trigger? Seems to right up the alley of the people who check out this site. Thanks for the suggestion of Phil Hamilton. I have lots of plans to review lots of albums. I do as many as I can as time permits. Great tunes. Do yourself a favour and purchase “Unsung”. Stay tuned for the video release of “The Tears”. It’s a hoot! If you’re seeing popups on Saving Country Music, it is Malware on your phone. I’m very sorry this is happening, but it is completely out of my control. It doesn’t matter if it seems like Saving Country Music is the ONLY site that is serving them. There is a strain of Malware currently out there that ONLY manifests on mid range sites like Saving Country Music so you blame the site, not your device, and make no effort to remove the Malware. I suggest upgrading to the latest version of your browser, and downloading Malwarebytes and do a complete scan. Saving Country Music is completely clean and has been and continues to be exhaustively scanned to make sure there are no issues with the site. This issue has been happening for the past couple of weeks with the latest Malware strains. And if there were issues on the site, Google and other companies would shut the site down immediately. Once again, sorry for the issue. I have every Doug Bruce album and loved them all but this one is the best of them all! I love true country music and this album does it so well, Doug has a magnificent voice and these songs bring out the very best of his quality tones. I have played it so often that even my dogs are humming the tunes! Well done Doug and Buddy. Unbelievable! And unbelievable steel on GREATEST EXPERT! Love it, Doug and thank you, Trigger, for posting this! This made my weekend! Sounds great! Will have to add it to the collection. I see also that Roo Arcus is finally going to be available in April on the American Amazon site. This sounds great – I’m definitely going to be buying this before long. Thanks for introducing this to me, Trigger. This comes closer than most to actually deserving that top 2 thumbs up rating. I grant you that much. I always check here and give everything a listen. Appreciate the website devoted to country music. When you get a chance can you give Fanny Lumsden a listen? I stumbled across her and found it to be a great listen. Another fellow Australian. It is pretty interesting where you can find great Country Music these days. Thanks for this review. Me likey. If you had said this guy was from Texas rather than down under, I’d have never thought it weren’t true (not that it matters where a guy comes from). Good music is good music. Good guitar work on there but that’s about it.